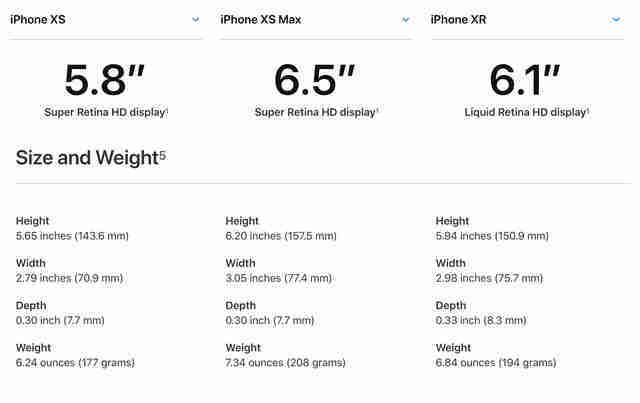 Out of all of the new products Apple announced (so far) at its much-anticipated event on Wednesday, the iPhone Xs Max is the biggest. Literally. It's a huge phone that's easily worthy of Apple's new "Max" monicker. In fact, it boasts the biggest display Apple has ever put in an iPhone even though its overall form factor is smaller than last year's iPhone 8 Plus. But that's not all there is know about this year's iPhone screen sizes. There's a lot more. Apple's 2018 iPhone lineup includes three new phones -- the iPhone Xr, iPhone Xs, and iPhone Xs Max -- the first and last of which feature display sizes that are firsts in the history of the iPhone. 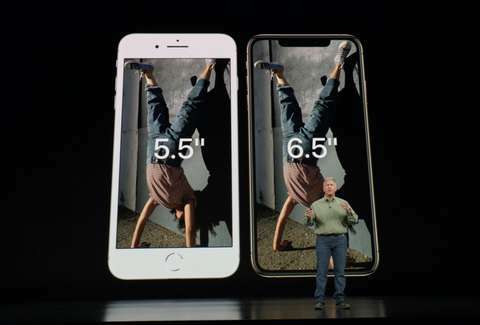 Meanwhile, the iPhone Xs will maintain the same size as the iPhone X. The iPhone X was the only iPhone in 2017 to ditch the handset's home button and bezels at the top and bottom of the display for a nearly bezel-free Super Retina Display with a "notch" at the top, but this time, all three of the new phones will follow the iPhone X's design. That means nearly all of the screen space on each model will be a useable display instead of a display sandwiched by blank space at the top and bottom (where the home button would be) like the iPhone 8 and iPhone 8 Plus. No matter which new iPhone you choose, you're getting a whole lot of display. Specifically, the iPhone Xs comes with the same 5.8-inch display size as its direct predecessor, the iPhone X, while its bigger sibling, the iPhone Xs Max, sports a giant 6.5-in display. That makes the Max's display roughly over 18% bigger than that of the iPhone 8 Plus, which is also a very large phone. Both of the Xs displays will use OLED (organic light-emitting diode), which is sharper, more vibrant, and more efficient than LCD displays. Meanwhile, the slightly lower-cost iPhone Xr features a 6.1-inch LCD display. Yes, the front of all three models will be black, and yes, all three models will have the "notch" made famous by the iPhone X. Both the iPhone Xs and iPhone Xs Max displays support Dolby Vision and HDR10 and what Apple clams to be the best color accuracy in the industry. "iPhone Xs and iPhone Xs Max offer a million-to-one contrast ratio with remarkable brightness and true blacks while showing 60 percent greater dynamic range in HDR photos," the company said in a press release. "iPhone Xs Max delivers a more immersive experience with over 3 million pixels for videos, movies and games, offering the largest display ever in an iPhone in a footprint similar to iPhone 8 Plus." 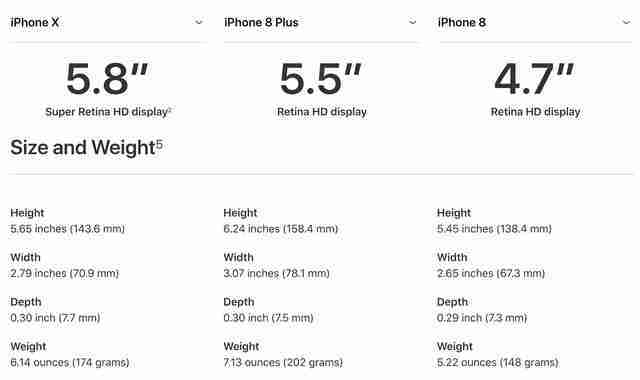 For a quick comparison of the new iPhone against the preview generation, check out Apple's exact dimensions (shown below).